Sunday Cycles Kid’s Bicycle Drive – DONATE NOW. Sunday Cycles Bike Shop is running an “ADOPT A BIKE” bicycle drive. They are asking customers and friends to “adopt” a kids bike/s to be donated to a local charity and school in an underprivileged area. If you can only afford one, that’s amazing, if you want to donate a sum toward bikes, that’s amazing, if you can step up and donate $200.00, $500.00, or more….. that’s amazing. They would like to get 250 bikes purchased, built, and donated by Christmas Eve. Joe is selling these bikes at his cost plus shipping. 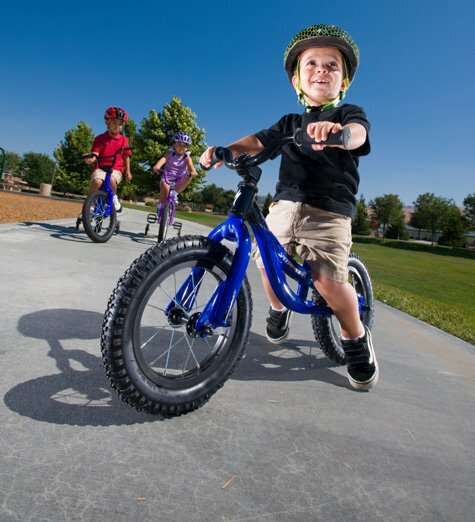 12″ bikes are $29.99, 16″ bikes are $44.99, and 20″ bikes are $49.99. These are special prices that Joe has negotiated with the vendor and are only good for adoption purposes, not for purchase. They have joined with The Fusion Foundation, a great local non-profit, so all donations are now Tax Deductible. Please call Joe Berman at 480-440-2142, or email him at service@sundayproshop.com to adopt bikes or ask questions. Orders must be in by this Monday. ALSO – If you are in the area, Joe also needs volunteers to help build the bikes. More info here. THANK YOU ALL!!!! Let’s rock some kids world!!! This entry was posted in Cycling and tagged Kids on Bikes by Judi. Bookmark the permalink. kyds on bykes. Sunday is okay dokay. @chris, that is awesome. love it. What’s with that link of yours ?? Firefox flipped out and said it was a scam. Cool deal with helping the kids. I wish I had coin at the moment to help out but my timing belt says otherwise. Figured that. Just never seen anyone do that before. Was wondering if it was some new fangled interweb thing I didn’t know about. alright people – time to donate. i just gave joe my money for a bike, you guys should too. there is only 36 hours left to donate! the donations are pouring in! with a lot of support coming from DC readers! Thanks to everybody for making this holiday season extra special for hundreds of children! I’m heading over to Sunday with a couple of wrenches to help put these bike together. Push it forward.